I expected this book to be cute, but I wasn't expecting this book to be as hilarious, honest, relatable, and addictive as it was. The author made me laugh out loud so many times while reading this book! The author and her stories felt so genuine and relatable. As a woman in her early twenties, I recently went through/I am going through a lot of similar situations that the author described in this book. I thought "OMG, YES! ME TOO!" so many times while reading this book. Reading this book felt like I was reading the diary of my best friend. The author's writing style was so charming and real. Some stories seemed a bit ridiculous, but they were still extremely entertaining. I loved reading about the trials and tribulations the author faced as she was trying to find herself and figure her life out. I do wish there would have been more stories about her profession as a bridesmaid. 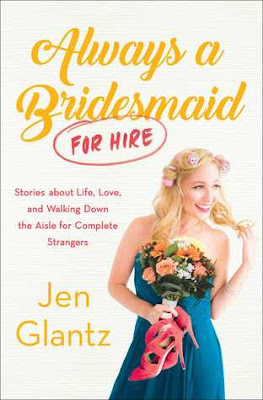 I really enjoyed the stories that the author did include involving her time as a professional bridesmaid, but I was expecting and hoping for more of those stories. The stories in this book were weaved with honesty, humor, and life lessons. This constantly put a smile on my face. If you are looking for a delightful, endearing, and hilarious book, then I would recommend picking this book up!